This fabulous ski chalet offers an amazing space for your family to enjoy all that Muskoka has to offer! 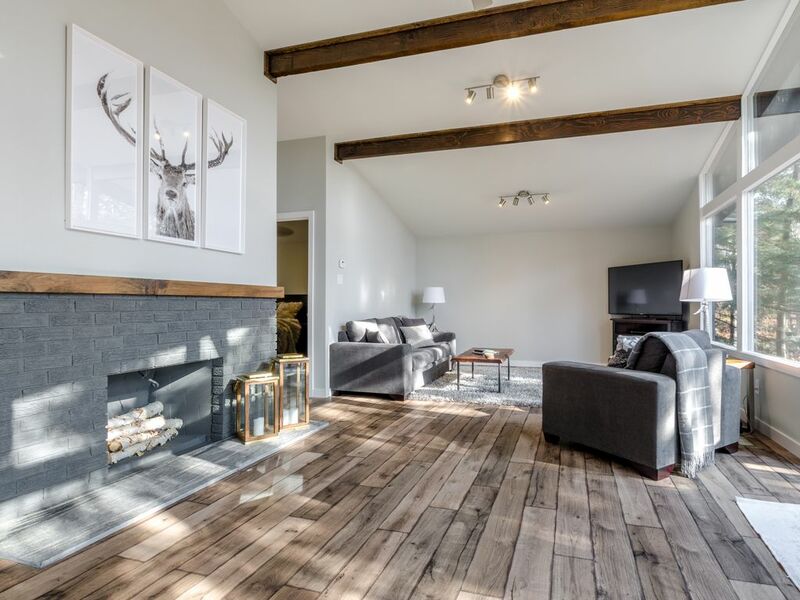 This chalet has been completely renovated and offers a great space for entertaining while having the natural setting enveloping the home creating beautiful Muskoka Views from every window. There is a large welcoming foyer for all of your ski gear opening to the lower level rec room with pull out couch for extra sleeping space.The lower level also features a main 3-piece bath plus two guest bedrooms with queen sized beds. The open concept design on the main floor maximizes the space while the vaulted ceilings allow for copious amounts of natural light to filter through. The kitchen offers plenty of cabinets fully equipped for dinner parties and opens to the dining room which has access to the front deck with a great BBQ area. The living room offers tons of space and the fireplace anchors the room adjacent to the wall of windows overlooking the outdoor fire pit and side yard. The main floor features a Master Bedroom right beside the main floor bath with large tile & glass walk in shower. All of the bedrooms, living room and rec room in the chalet have flat screen televisions equipped with Cable and Netflix and complimentary wifi. Walking distance to Hidden Valley Ski Hill and a great short cut to ski back to the chalet right from the ski run at the end of a long day on the slopes. Minutes to Downtown Huntsville offering fantastic shopping on Main Street, tons of excellent restaurants, bowling alley, cinema, local live theatre, Summit Centre Hockey Arena and Pool. Arrowhead Park offers tons for the family to do year round and just a 10 minute drive away offering a skating trail through the woods, snowshoeing trails, cross country skiing, skate skiing trails, snow tubing and fabulous hiking trails during the Summer. Guests can enjoy access just down the street to the private Hidden Valley Association Beach on gorgeous Peninsula Lake with sand shoreline, family bbq area, kids play set and great dock for those hot summer days. Just a few minutes drive to Deerhurst Resort and world class golf courses including Mark O'Meara & Deerhurst Highlands, Deerhurst Lakeside, Grandview Inn Course, Huntsville Downs and North Granite Ridge Golf Course. Explore all that Algonquin Park has to offer just a short 45 minute drive from your door step to the West gates, you can take a day trip canoeing, kayaking or hiking and have a short drive back to the chalet for dinner. Many other fun things to do in the area like climbing the Dorset Tower especially in the Fall to see the vibrant colours, hiking at the serine Limberlost Reserve, take the kids to Muskoka Heritage Village or drive to the top of Lions Lookout to see the gorgeous view of Huntsvilles Downtown. Tons of Fabulous restaurants nearby including; On the Docks Pub, 3 Guys and a Stove, Tall Trees, That Little Place by the Lights, Bo's Thai, Muskoka on the Rocks, Steamers, Family Place, Louis II and so many more! Fabulous location with a chic ski chalet/summer cottage ready for your family vacay! All Linens Provided including, sheets, pillows and pillow cases. We have a fire pit area with log seating around it making a great spot for camp fires and cooking s'mores. The ski hill is just up the street. Chalet has everything- great kitchen and living area; comfy beds and beautiful surroundings. We rented for a base for our daughters wedding at Hidden Valley, The Chalet was the perfect location, and backdrop for pre wedding activities, especially pictures. It is well equipped and beautifully decorated. We highly recommend, and would definitely stay again. We rented the chalet for a 5 day winter vacation, and enjoyed the fantastic cross-country skiing nearby, while cooking wonderful meals back at the chalet in the evenings. The chalet is well-appoijnted, very comfortable for a group. We were three individuals, but three couples or a family with several kids would find this chalet spacious and comfortable. Beautiful place to stay. It had everything we needed. It was very clean and well maintained. Absolutely stunning and tasteful property, loved staying here! It was an absolute pleasure to stay here, such comfortable accommodation every last detail thought of, perfect escapism in beautiful surroundings, we didn’t want to leave! We thoroughly enjoyed everything about our stay here and would highly recommend! Very welcoming and accommodating owners. Beautifully decorated and excellently maintained cottage. Owners are very accommodating and easy to reach. It is a lovely place, beautifully decorated, very well kept, providing a romantic setting.